Convicted former House Speaker Pete Kott has been denied a late start to his 6 year prison term for bribery and corruption. U.S. District Court Judge John Sedwick today ordered Kott to begin his 6-year prison term on Thursday in Sheridan, Oregon, reports the AP. Kott tried to get a delay until February 1st so that he could see the birth of his grandchild from his daughter Pamela. Sedwick said Kott has had plenty of time to put his affairs in order and that there's no assurance the child will arrive on its due date Monday. At docket 307 defendant Kott asks the court to delay the date when he must report to commence serving his sentence from January 17, 2008, until February 1, 2008. The request is based on the fact that defendant's daughter is expected to give birth to a child on or about January 21, 2008. The United States filed an opposition to the motion at docket 310. Defendant was convicted of three felony charges involving public corruption. 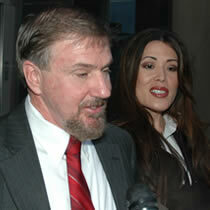 The jury's verdicts were returned and filed on September 25, 2007. On December 7, 2007, defendant was sentenced to serve a term of 72 months of incarceration. Over objection by the United States, the court allowed defendant to self-surrender upon designation by the Bureau of Prisons ("BOP") of the facility where his sentence would be served. BOP has recently designated the institution and established a report date of January 17, 2008. While it is impossible not to have some solicitude for defendant's request, on balance it would be inappropriate to grant the relief sought. To begin with, it must be observed that defendant's crimes are serious ones involving breach of the public trust, so that further delay is inconsistent with the gravity of the offenses. Second, prior to the designation of the facility, defendant was given special permission to travel outside the District of Alaska for family activities and personal matters. Third, defendant has had ample time to put his affairs in order. Fourth, a child whose due date is January 21 might not be born until after February 1, giving rise to a request for further delay. Fifth, even were the child born prior to February 1, there could be complications attendant on the birth which would prompt a request for additional delay. For the reasons above, the motion at docket 307 is DENIED.